Apply almond oil under your eyes and gently massage the area. This action is good for marinating healthy blood circulation and for reducing the appearance of fine lines and wrinkles around the eyes. Use this remedy every night before going to the bed. Make a mixture by mixing 2 teaspoons of sweet almond oil and teaspoons of honey. Use this mixture for massaging the area under your eyes. Leave it on for overnight. Rinse it off in the morning. Make smooth paste by combing equal amount of sweet almond oil and all-natural milk powder. Apply this paste under your eyes. Leave it on for at least 10 minutes and then wash it off. Olive oil massage is also beneficial in the treatment of dark circles. Wash your face in the morning and keep small ice packs on your eyes and leave them on for 10 minutes. Try to keep your body well hydrated by drinking plenty of water throughout the day. Take plenty of good night sleep. 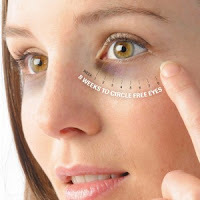 Apply cucumber slices or potato slices on your eyes ( if you want you can also apply cucumber/potato juice) leave them on your eyes for about 15 minutes.